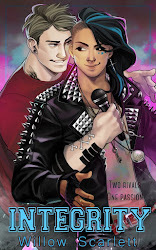 Chapter two of my Wattpad serial m/m romance is now live! Omega Blues is the spin-off sequel to Jagged Rock. Both stories are completely free to read. Being a werewolf has always felt like a curse to Bren, even after he's let into a friendly pack of mostly-humans led by his alpha nephew Will. The Jagged Rock Pack are friends and members of a rock band, standing together even after their vocalist came out as a werewolf. It's Will's plan to turn all the members of the band into werewolves, and that sounds like a great plan... except for Matt.Matt is funny and kind and endlessly helpful, the sort of guy anyone would want for a friend. Unfortunately, as a werewolf he's marked out to be an omega which comes with its load of weaknesses and agonies.It's Bren's job to look after Matt and help him with the transformation. He didn't plan on falling for him, especially because Bren's never felt anything like love or attraction before. 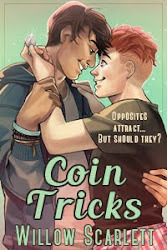 It's another complication in his already difficult life.Matt's had a crush on Bren from the moment they met, and he loves teasing and flirting. He's delighted to think he might have a chance.Matt would do anything to become a werewolf, and Bren would do anything to stop him. How can the two have a chance at happiness or a life together? Kitchen Wolves, and what do we call chairs? New werewolf m/m romance chapter! First chapter of my free Wattpad story!